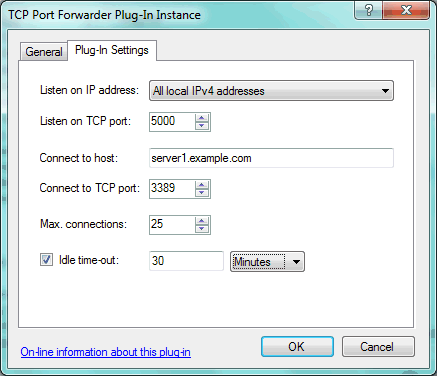 This plug-in provides simple TCP port forwarding. If the Simple DNS Plus computer is connected to both the Internet and to a private network (LAN), this can be used to forward connections from the Internet to a computer on the LAN. For example mapping remote desktop connections (port 3389). The local IP address that the plug-in should listen for incoming connections on. The local TCP port number that the plug-in should listen for incoming connections on. The server host name or IP address that connections should be forwarded to. The server TCP port that connections should be forwarded to. The maximum number of connections that can be forwarded at the same time. If enabled, the connection will be closed if no data has been sent in either direction for this legth of time. Note that this plug-in does not provide any DNS records or any other functionality related to directly to DNS. But you can of course point domain names to the IP address that the plug-in listens for connections on, using A-records provided through local zones or other plug-ins. - Fixed: Threading issue causing crash with NullReferenceException.